Made with all natural beef, this is a delight on the BBQ! 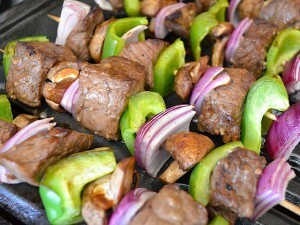 This delicious kabob recipe is great for bringing to a large gathering or for cooking up outside for that special event. They are always a fan favorite and you can customize the recipe to include more fruits and veggies to go along with the kabobs if you would like as well. Cut the beef into ½ inch by ½ inch squares. Peel the onion and cut both the onion and bell pepper into medium sized squares. Trim the bottom of the stem off of the mushrooms and brush of any dirt that might be on the outside of the mushrooms with a dry brush or your fingers. Do not use water. Slice thick. On 5 inch metal skewers or wooden skewers (be sure to soak wooden skewers in warm water for 30 minutes before using) slide on a piece of onion, beef, pepper and then mushroom. Repeat that order, onion, beef, pepper, mushroom 3 times per skewer. Drizzle a little bit of olive oil, salt and black pepper on the kabobs and grill on a nice hot grill for about 3 minutes per side for a medium rare temperature on the beef.